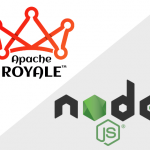 This example shows you how to use HTTPService to access external data to use in your Apache Royale application. You can use HTTPService to retrieve data in XML, JSON, or other formats. We’ll use Github API services to get JSON formatted GitHub data so we can load info about the code of this example, which is hosted in GitHub. It uses the new Jewel UI set that supports themes and is available in the 0.9.4 release or later. 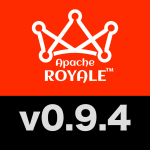 We create an Apache Royale interface that shows a text code panel to load the source code of this example in it. Github doesn’t let us load a page from its domain in an iFrame, so this is the only way to embed GitHub content in your application. The text code panel is made of pre and code html tags with some custom style to make the background white. We provide a Label to show accessing Json data directly with dot notation. Finally we provide a button to trigger the HTTPService. Tip: We use the ScrollingViewport bead to add scrolling behavior to our text code panel. The most important piece in this example is the custom GitHubService class that wraps the HTTPService object. We declare it in MXML in our application to pass the Github URL to request and declare an event handler to show the data once it is loaded. We instantiate the HTTPService in the constructor, and declare an event listener for the HTTPConstants.COMPLETE event, so we perform actions when the data finishes loading. The action we do from this class is throw a new event “dataReady” to consume in our application. sourceCodeUrl will pass the GitHub url to be called by our service class, and fillsHTTPService.url so HTTPService knows what url to target. As we get the data loaded, we can manage it with HTTPService.data, and we have a convenient HTTPService.json getter to access the JSON Object that HTTPService already parses for us. We exposed this data in our json class as jsonToString and json getters respectively. Finally, the source code is in the json.content variable, but comes encoded in base64, so we can use Apache Royale’s decode function in the Base64 class to get the decoded xml string to use in our example App. We exposed this in a convenient getter function in our service called sourceCode.